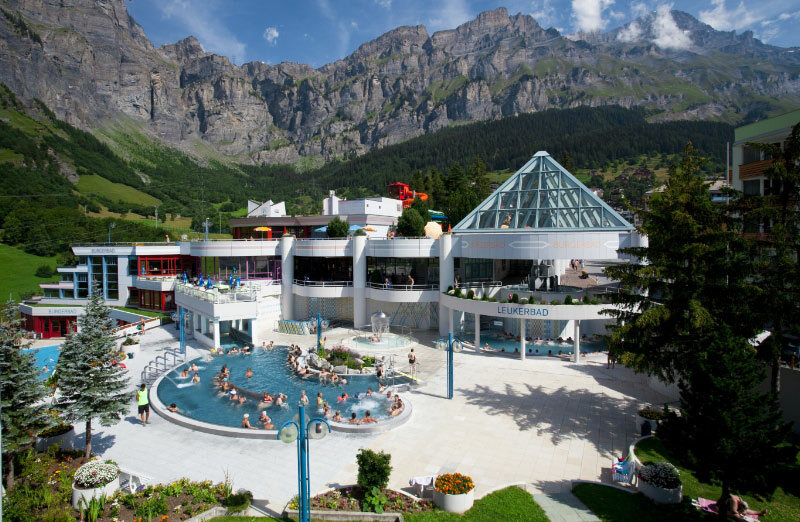 The small Alpine resort town Leukerbad (Loèche-les-Bains) claims to have the largest hot water spa in the Alps. The town has various spa baths ranging from exclusive adults-only facilities to very family-friendly pools and water park complexes with water slides. Leukerbad is a great day-trip destination or weekend retreat from Geneva, Lausanne, and ski resorts in the Valais (Wallis) region of Switzerland. Leukerbad is a beautifully located small town in the Alps with wonderful views of the mountains lining the Swiss Rhone River valley in Canton Valais (Wallis). Leukerbad (Loèche-les-Bains), at 1411 m above sea level, claims to be the largest and highest hot water spa resort in the Alps. Leukerbad offers wonderful winter sport facilities as well as popular summer-time hiking routes. Cable cars transport skiers and hikers up into the mountains where it is possible to cross the Alps on foot to Kandersteg. Endless hot water is what mostly distinguishes Leukerbad from other resort towns in the Valais Alps in Switzerland. At Leukerbad, 3.9 million liters of 51°C hot water flows to the surface to feed around 30 hot water pools in many different spa facilities. In addition to the day spas open to the general public, many Leukerbad hotels also have their own private spas and baths only open to hotel staying guests. The largest and best-known spa baths in Leukerbad is the Leukerbad Therme (previously known as the Burgerbad). Many package deals include daily admission or at least discounted admission for guests to the Leukerbad Therme (Burgerbad). The pool complex is very family-friendly with special discounts and children under 8 usually entering for free. The kids-friendly facilities include special pools and play areas for small children. Children also love the toboggan water slides. The facilities at the classy Walliser Alpentherme & Spa Leukerbad (previously Lindner Alpentherme) makes it clear that spa facilities are not really suitable for children under 6. As a luxurious and relaxing day spa, Walliser Alpentherme is hard to beat. Further public hot water spa facilities are available at the Volksheilbad and the Rehazentrum. Both also offer medical cures and remind more of rehabilitation and medical facilities than pleasure baths. See also Top Day Spas in Leukerbad, the Exclusive Walliser Alpentherme, and the Family-Friendly Leukerbad Therme for more details. Two cable car lines depart from Leukerbad. The Gemmi Bahn (½ Fare Card & Junior Card valid) goes up the rock face to 2350 m – almost a kilometer higher than Leukerbad itself. In winter, it is possible to hire sledges at the top station for two spectacularly fast tobogganing runs down to the iced and snowed-over Doubensee lake. It is worth the small charge for the small cable car back to the top or otherwise it is a hard trek. It is also possible to hike through the Gemmi pass to Sunnbüel, from where a cable car goes down the Alps to Kandersteg on the northern side of the mountains. This hike, of the only pass linking Wallis and Bern, is possible both in summer (2.5 hours) and winter (3-4 hours). The Torrent cable car gives access to the Rinderhütte ski area (2350 m), while ski lifts go higher up to 2610 m. In addition to 50 km of ski slopes, a 4-km winter panorama hiking trail give visitors spectacular views of the highest Swiss Alpine peaks on the opposite side of the Rhone Valley. In summer, it is possible to use large scooters for fast descents back to Leukerbad. Leukerbad has a population of around 1,500. The town lives from tourism with around 9,000 beds available in various hotels, holiday chalets, and flats. As a result the local supermarkets (Migros – near the Burgerbad and PAM) even opens most Sunday afternoons while bakeries are open all-day on Sundays. Leukerbad has many fine hotels but holiday chalets and apartments (flats) are even more numerous. Advance reservations are usually essential, especially for winter weekends. Lucky indeed are travelers who can arrive on Sunday or Monday – they can expect lower prices and fewer visitors at all facilities. Leukerbad (Loèche-les-Bains) is just inside the German-speaking part of Valais (Wallis). However, many locals effortlessly switch from German to French or English or Italian as required. Getting to Leukerbad is very easy by car or public transportation. Drivers simply follow the main highway from Lake Geneva past Sion to Leuk, and from there the narrow, winding road up the mountain to Leukerbad. Drivers arriving from Central Switzerland should use the Lötschberg car train tunnel. If using public transportation, use the train to Leuk and change here for the bus to Leukerbad. The LLB buses frequently link the two towns for around CHF11.20 (½ Fare Card and Junior Card accepted) per person – a minibus taxi will be around CHF80 one way. See Swiss Railways for online public transportation timetables. It is possible to walk almost anywhere in Leukerbad, which is fortunate as parking is at a premium and the town center is closed off for cars. Many streets may also not be used between 10 pm and 5 am – Leukerbad is not a party town. A cheap local bus follows a circular route through Leukerbad (Ortsbus / Navette Ring-Jet). See also Transportation to Leukerbad for more details on driving and public transportation to Leukerbad.